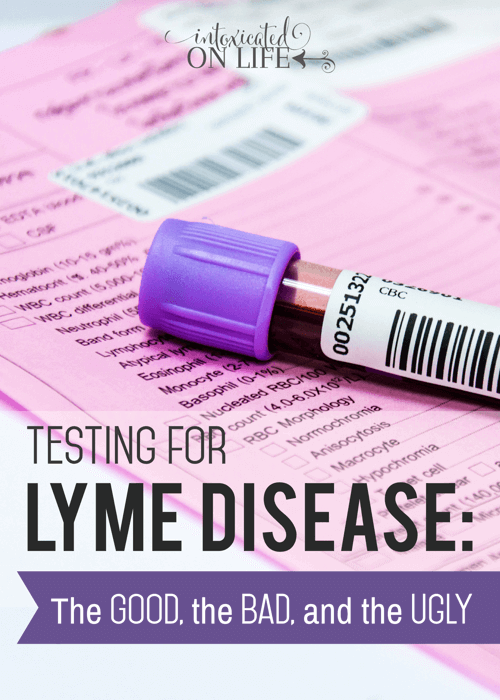 Let’s get serious about testing for Lyme Disease. Imagine a world where the approved screening test for a disease running rampant misses 55% or more positive individuals. Imagine a world where a second screening test is available, but this test still misses 20-30% of positive individuals. Imagine a world, where the CDC has removed vital pieces of information from this test, making accurate diagnosis extremely difficult. Imagine a world where insurance only pays for these two tests, a world where the government, insurance companies, and CDC stick their heads in the ground and refuse to acknowledge there is a problem. A world where much more sensitive tests are available, but insurance refuses to cover them…the CDC refuses to accept them…government turns a blind eye. This is your world when it comes to testing for Lyme Disease. I’ve done a lot of reading over the past several months, but I won’t try to pretend to be a lyme testing expert. Since this has been the #1 question I’ve had since sharing my diagnosis of Lyme disease, I’d like to share enough for you to get a rudimentary understanding of Lyme testing. I’ll also link to some articles where you can read more about the currently available tests as well. In the end, if you suspect Lyme disease, I’d encourage you to go to ILADS.org and use their physician finder feature to find a Lyme-literate medical doctor. If you don’t have a highly knowledgeable doctor on your side as you explore whether or not you have Lyme disease, you’ll be at a great disadvantage. The current, approved Lyme disease testing is an initial screening with an ELISA test. If this test is positive, the CDC recommends following up with a Western Blot test. The problem is, the ELISA test misses at least 55% (though, some research indicates up to 70%) of individuals who are actually positive for Lyme disease. Many doctors, falsely believe this is good enough to rule out a Lyme diagnosis and stop here. Personally, this sounds like a worthless waste-of-money test. Only if you have a positive ELISA test does the CDC recommend a Western Blot. The Western Blot tests approved by insurance companies have some problems of their own. When you receive a Western Blot from an insurance approved lab like Quest or LabCorp they have removed some vital information. While the Western Blot seems to be a better test than the ELISA, most commercial labs don’t test for two of the bands that are most indicative of Lyme disease (bands 31 and 34). They were removed a number of years ago when a vaccine for Lyme disease was being developed—if a person received the vaccine, they would test positive on this test. But there isn’t a Lyme vaccine available. So why are these bands still missing from most labs? 1. If testing for Lyme Disease is done too soon after infection, antibodies won’t show up. Your body simply hasn’t had the time to develop antibodies to the infection yet. 2. If the testing is done late, then the antibodies might not show up. With chronic infections, antibodies often decline over time and aren’t detectable. 3. Individuals with a compromised immune system often don’t create enough antibodies to show up on blood tests. What Good Lyme Testing Options Are There? Thank goodness there are more accurate tests out there. Mind you, these aren’t 100% accurate, but they are definitely better than the CDC approved alternatives. 1. Igenex is the lab that is most commonly cited as being the gold standard of testing in the Lyme community. Igenex offers a Western Blot test that still includes bands 31 and 34. 2. Though not as well known as Igenex, Immunosciences is the lab my doctor suggested we use. He believes this to be even more sensitive than the Ignex test. My test was lit up like a Christmas tree—no denying a positive test with me. Side note: my insurance actually covered part of this test: about ¼ of the cost went towards my deductible. 3. Fry Labs uses microscopy to look at the blood. I’ve read many positive things regarding this lab, particularly in diagnosing co-infections, which can often complicate treatment if not appropriate addressed. 4. Advanced Laboratory Services isn’t dependent on antibodies at all, but cultures the actual Lyme organism: borrellia. This is a novel approach, considering the problematic nature of testing for antibodies. What if all of the tests come back negative? If all the testing for Lyme Disease is so inaccurate, what’s a girl (or guy) to do? Good question. Very good question. In the end, most well-known lyme experts agree that Lyme is a clinical diagnosis. This means, if all of the tests are coming back negative, but a person clearly exhibits the signs and symptoms of Lyme they can be clinically diagnosed as having lyme disease and treated. The tests, as you can see, are greatly limited. Someday, I hope doctors will be educated. Someday, I hope our government will allocate the same amount of funding to combating Lyme disease as it does to diseases like breast cancer and HIV. But Lyme isn’t a very trendy disease. Lyme is modern-day leprosy. The medical community, the government, and the insurance companies don’t want to acknowledge us. If they don’t talk about it…maybe it will just go away? No, this is the real world. With 300,000+ new Lyme cases each year, we won’t be going away anytime soon. Sharing at The Jenny Evolution, A Look at The Book, Pam’s Party & Practical Tips, and The Modest Mom Blog. What a fantastic article. I was diagnosed with an ingrown hair, I mean, a Lyme infected tick bite in July of 2013 and my life has been a roller coaster ever since. Thank you for the comment, sorry to hear your life has been a roller coaster. Have you found any relief in the last 2 years? Do you feel your treatment protocols are working? I am a physician and we get browbeaten with the dogma that Lyme is rare and over diagnosed. This is a refreshing perspective and I am going to read the links in your post to try to gain more insight. As I make the transition back from inpatient to outpatient pediatrics, I am sure I will see more and more cases. Thanks for the comment. As a patient, I greatly appreciate that you are taking the time you are taking to educate yourself. I know the sooner that lyme is caught, the easier it is to treat. It took the doctors about 2 years to figure out what was wrong with me, and it’s because I was the one who pushed and asked questions and researched. I know that are so many others that have been afflicted with this disease and it goes undiagnosed for many more years than mine went! I really appreciate hearing from doctors who are trying to understand lyme. Thanks for the heads up. I hadn’t seen that test, but will be sure to check it out! I have just recently been diagnosed with Lyme. I’ve been going to different doctors for the last 3 years trying to figure out what was wrong with me. I tested positive on the Western Blot test. Should I be worried about a false positive? No, if you got a positive it’s definitely positive! Trisha, thank you for raising awareness for Lyme disease. I’ve been diagnosed with Chronic Lyme since 7/2015. My first tic bite (that I remember) was back in 2001 with a classic bulls-eye rash. I got 10 days of doxy. In July 2015, I was bit by a mosquito and was bedridden for a month. Finally got some help at the end of the month with more doxy, but again just 14 days. I finally found a doctor to treat me in October 2015. Like many with Chronic Lyme, it is a roller coaster ride. I have good days and bad days. Please keep spreading awareness. It really is a roller coaster ride! I hope you are able to get treatment that really helps your body heal. My 5 yr old daugter has had the symptoms back and forth dr nvr thought of it after reasearch i asked him to test her and just yesterday found out it was positive he said thank you for teaching me something new and now im lost how will i know what stage shes at ive been up all night tryi g to educate myself on this disease any information you have will be greatly appreciated. Thank you! I’m so glad you were able to find an answer for your daughter! I hope that you can find a good doctor who will help you come up with a treatment plan to heal her body. Blessings! I came across your article and being a mother whose child was diagnosed with post Lyme arthritis caused by Borellia and treated with two week IV antibiotics, had lingering symptoms for three years.. I can say that the moment one “educates” through the net is on slippery ground. I did the same since my child was not getting better. I came across so much info that made me very anxious and prone in finding the clinical picture of my son through many personal histories online. Unfortunately most are horror stories and dead ends. I don’t recommend anyone to educate themselves online. I do recommend much prayer, holy Eucharist, confession, adoration of the Blessed Sacrament as much as time permits (making it a priority which I am sure one can always find the time.) God is alive and heals even as we speak. I prayed that he put the right doctors in our life so as to help my son who had post Lyme arthritis and later Chronic Recurrent multifocal Osteomyelitis. If you would go to a doctor they would always say it has nothing to do with the Borellia and I had a hard time believing them due to my extensive reasearch online but no medical degree. This is what I mean by slippery ground the point when one puts himself in the same position of an educated Doctor can be detrimental to your and in my case my child’s recovery and life. I read so much online that I came to the point that I did not trust any of the doctors and questioned there knowledge and experience in treating my son. Please do not read up on it ( Doctors have received extensive education and the moment we think we can compete with them by educating ourselves to the point that you question there expertise is against reason and rationality. It can only make his/ her recovery more difficult and your life harder and fear takes over. Are there lingering symptoms after being treated and tested and confirmed with Borellia, yes! One thing is that one needs to entrust there life to God. Pray for the Grace to be able to give your child or life to God unconditionally! Pray that the Holy Spirit enlightens the Doctor to help your child or yourself! everything is possible with God, our creator, just believe, pray and never lose Hope. The day I gave my life and consecrated myself to the Sacred Heart of Jesus and to the Holy Mother of Carmel I surrendered myself admitting I cannot heal my son but only God. I pray everyday that God protects us and helps us carry our weaknesses by changing them into virtue on his Glory. I consecrated my Family. My son is now a healthy 9 year old boy who received physical healing by the annointment of the sick, receiving God in body and blood at mass, as well many prayed rosaries to the Blessed Mother Mary and Precious blood of our Hesus Christ, adorations, breviary prayers, the lying of the hands of the priest praying for spiritual and physical healing. I can say I was blessed by the illness and at the same time he was healed by our Lord as so was I from heavy menstrual bleeding. I give it to God and you will see he will direct you to the right Doctors and believe me He does not want to see any of his children suffer, just believe that He can heal you if it’s his Will to heal you! If not, God knows why and do doubt but always believe that he knows best, better than you know and pray that he helps you carry your cross on his Glory!! While I certainly respect your dependence on the Lord in matters of health (and all matters), and while I certainly echo your sentiments about not believing everything you read online, I’m afraid I just don’t quite understand some of your points. 1. Just in case you thought differently, it isn’t my intention, writing about my own journey with Lyme disease, to prescribe what anyone else should do. Any and all of the tests I mention in this article need to be carried out by trained medical professionals. Merely knowing about Lyme testing doesn’t solve the problem. 2. While I also echo your emphasis on prayer, the church, and dependence on God—even your belief that it is God who ultimately heals us—I’m not exactly sure what you mean that God “will direct you to the right doctors.” No doubt, God can direct us to the right doctors, but why can’t God also direct us to the right information we need to find the right doctors (even Internet articles)? I am glad I came across your website. I was actually looking for information about bone broth, and searched “lyme” to see if you had any info there. My twelve year old daughter has been “diagnosed” with lyme. Her health situation is a long story, but her bloodwork showed IgG P66, IgG P41, and IgM P23. According to the info contained on the bloodwork from Labcorp, this is not enough to give a positive diagnosis. However, I am understanding that doctors do not necessarily agree on that criteria. I am praying about how to move forward with this when the bloodwork is not extremely clear. Any thoughts on this? I’m so sorry to hear about your daughter. Lyme is a nasty disease, but it sounds like you’re a mom who is being proactive in searching for answers! Kudos to you. That is correct that not all doctors agree with that. In fact, most lyme experts say because lyme is so good at “hiding” that lyme is actually a clinical diagnosis and doesn’t even always need a positive lab. You could always request one of the other labs be run – the Immunosciences lab that I had done “was lit up like a Christmas tree” (my doctors words, ha). But again, lyme is tricky and even without a definitely positive test she still might have lyme. I’d encourage you to look for a doctor who will work on using more alternative modes of treatment. 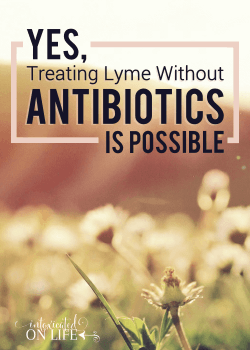 I’ve become more and more convinced over the years part of the reason a lot of people are not recovering well from lyme and having so many problems with relapse is because the antibiotics really tear up your gut which is a key to immune health. Once you go off the antibiotics, your immune system is shot and any little bit of lyme left in your system can easily take hold again. I believe I’ve had such great success because we’ve been able get the bacterial load down using alternative treatments while at the same time building my gut health and immune system. I was came down very sick in 2008 and I went for almost a year and a half and testing after testing before a doctor recommended me get test from Igenex. It came back positive. It has been a crazy journey. But today I am much better. I still have damage but at least I can function well.